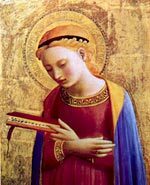 Thanks to the insight of fifteen-year-old Venerable Carlo Acutis, who died in the concept of sanctity in October 2006 (www.carloacutis.com), and to the generous and accurate research completed by the writer and journalist Nicola Gori, who also drew from various historical documents in the "Positiones" of persons whose cause for canonization is maintained by the Congregation of the Causes of the Saints, it was made possible to achieve this exhibition which presents 160 testimonies of Saints and of Mystics who have had visions of the Inferno (Hell), of Purgatory, and of Paradise. The exhibition is the fruit of careful and thorough research carried out on an international scale. The young Carlo was profoundly convinced that the rampant spread of sin in our times and the consequential loss of innumerable souls, are very often due to the disappearance of preaching on the Last Things. The experiences collected embrace all the centuries of the Christian era. 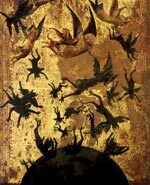 Through this exhibition the visitors will be confirmed in the truth of the existence of the Inferno, of Purgatory, and of Paradise, the reality to which each person is called to after death. One is only left to visit the exhibit and immerse themselves with an open mind to the solicitations which these episodes provoke. What Happens with and After Death? Where does death have its origins? God has neither willed nor created death in the manner we endure it today. 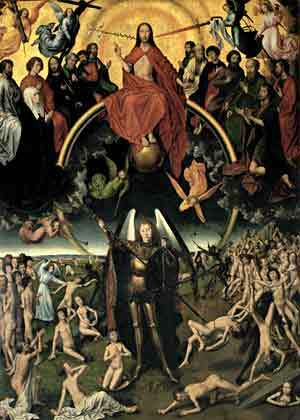 Death entered the world as a result of the first sin of our ancestors, Adam and Eve. It is therefore the “wages of sin” (Rm 6: 23). Today one tends to censor and remove this reality of human life. Just the thought of death itself creates anguish. By not thinking of it, one believes in keeping it away or overcoming it. In reality, death which is inexorable, comes and can come in any condition in which one finds oneself. It is precisely due to this Christian vision of death that Saint Francis of Assisi could exclaim in the Canticle of Creatures: Praise be to you, my Lord, for our sister corporal death (Franciscan Sources, 263). With death, one verifies the separation of body and soul. Man’s body gets corrupted, while his soul, which is immortal, goes to meet God in order to be judged. It will be reunited to its body at the end of time. What does it mean to die in God's grace? It means to die with the awareness of not having mortal sin on one’s soul. It means to die in peace with God and with one’s neighbour. This word is certain: if we die with Him, we will live with Him (2 Tim 2: 11). How is it possible to die with Christ? If possible, making use of the two sacraments instituted by Christ for the serious sick patients and for all those who are about to pass from this life to the next: the sacrament of the Eucharist as Viaticum and the sacrament of Anointing of the Sick. How has Christ conquered death? By destroying the cause of death, i.e. 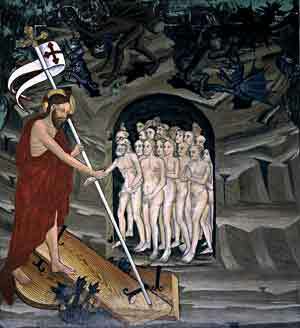 sin, with His Death on the cross and with His Resurrection. How can one describe the conditions of man after death? It is necessary to avoid imaginary and arbitrary representations which, instead of helping, deepen the difficulties of the Christian Faith. 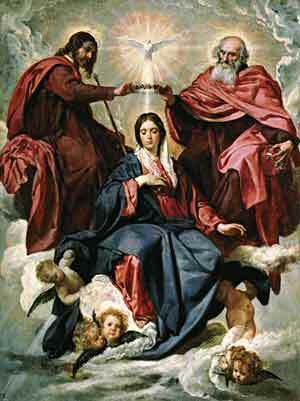 The images used by Sacred Scripture nevertheless merit respect. One needs to draw out from them the deep meaning, by avoiding the risk of attenuating them too much and emptying the realities which they manifest from their substance (Congregation for the Doctrine of the Faith, Letter regarding some eschatological questions). The soul, separated from the body, is judged by God in relationship with the Faith and with one’s deeds. This is the specific judgment, with which the immediate remuneration is given to each one for his eternal life. Paradise is the state of full and definitive happiness. This happiness consists of seeing God just as He is (1 Jn 3:2), face to face (1 Cor 13: 12). God will then be known and loved as the maximum, supreme happiness of man, the ultimate end and full realization of the deepest aspirations of man. 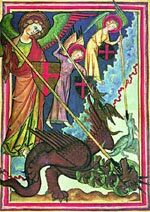 Purgatory is the purification of those who die in God’s grace, and therefore are already sure of being able to enter Paradise, but need further purification in order to obtain the holiness necessary to enter the joy of Paradise. How can we help such a purification? God purifies, with the merits of Christ who died and rose from the dead, all those in Purgatory, thanks also to the collaboration that we can give them. with Indulgences, which are the forgiveness granted by God of temporal punishment for the sins already forgiven as regards one’s offences. Every Christian pilgrim here on earth can acquire through the intervention of the Church, such Indulgences, if duly made available and under certain conditions, and can apply them to the deceased in such a manner that they can be relieved from due temporal punishment for their sins. The main punishment of hell consists of eternal separation from God: only in Him in fact man can have life and happiness, for which he has been created and to which he aspires. 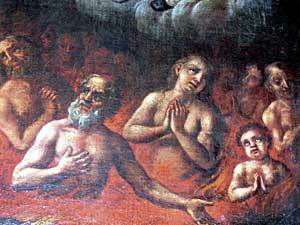 God does not predestine anyone to go to hell. Rather He, as a good Father, desires that everyone be saved and reach His Home: Paradise. He therefore sent His Son who died and was raised. 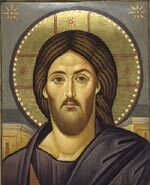 He does not want that anyone should perish, but that all should come to repentance (2 Pt 3: 9). He thus wants that every single person during his earthly life either kindly (benevolently) or sometimes even in a strong manner (as every good father does with his own son). And nevertheless, having created man free, God respects the decisions of every person, especially in the crucial moment of his death. Therefore it is man himself who, in full freedom and responsibility, excludes himself from Paradise and, by persisting in his radical refusal of God, merits hell. What is the Final Universal Judgment? ]. 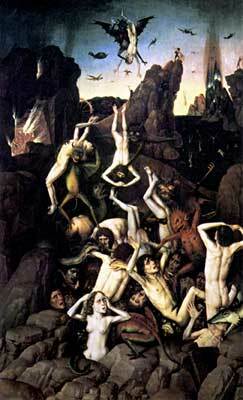 And those will be sent to eternal torture, and the just to eternal life (Mt 25:31-46). All the bodies of men will rise. 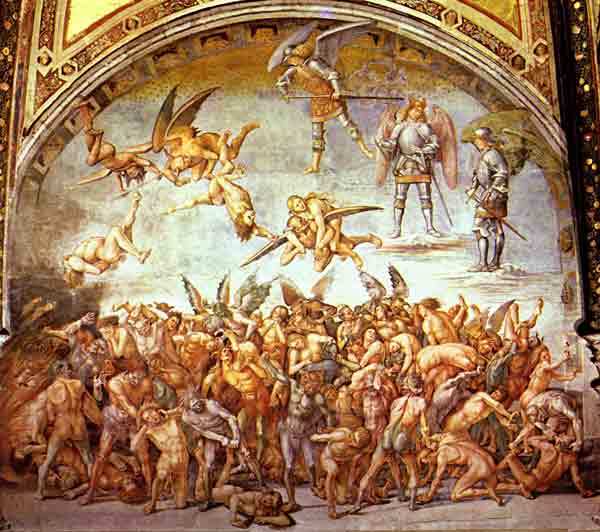 Every body, transformed from corruptible and mortal to incorruptible and eternal, will be united to its soul, sharing with it the condition of Paradise or of hell: a condition which it has from the moment of death of the body. Among all the saints in heaven there exists a fraternal communion which is extremely delicious, because everyone will have all the good things of all the other blesseds. Each one will love the other as himself and will therefore enjoy the good of the other as of his own. In this manner, the happiness of just one will be much more as greater will be the joy of all the other blesseds (St. Thomas Aquinas, (Conference on the Creed). There will be new heavens and a new earth (2 Pt 3: 13). The current universe, freed from all slavery, will be a new universe in which there will be no more death or mourning or wailing or pain because the old order has passed away (Ap 21:4). God’s plan to sum up all things in Christ, in heaven and on earth (Eph 1: 10) will be realized fully and definitively. God will be all in all (1 Cor 15:28). Only God knows the day and the hour of such a definitive event. We only know that it will take place “on the last day” (Jn 6:39), at the end of this world. On what is our faith regarding the resurrection of our body founded? on our Faith in God who is not a God of the dead, but of the living (Mk 12:27). is the principle, the foundation and also the certainty of our resurrection: He is the first born of those who rise from the dead (Col 1: 18); God, who resurrected the Lord, will also raise us from the dead with his power (1 Cor 6:13). How will the resurrection of our bodies take place? To know the way in which the resurrection takes place goes beyond the possibilities of our intellect. It is accessible only in the Faith. What is the difference between resurrection of the body and reincarnation? it is established that human beings die just once (Heb 9:27). In what sense does a Christian die and rise to new life every day? moral point of view: every day we are called to turn away from sin, to avoid it, to repent and to resurrect from it, in order to live joyfully every moment as children of God, seeking the things of above, where Christ is seated at the right hand of God (Col 3: 1). Congregazione per la Dottrina della Fede, Lettera riguardante alcune questioni di Escatologia, 1979. Please be sure to include your name, address and phone number with your request.